Quite a few websites started showing european visitors "You cannot use this site because of GDPR", probably based on GeoIP information. GDPR forbids coupling of acceptance and the possibility to use. I am not sure if the GDPR wall is illegal or not as there is neither acceptance required on the page nor a possiblity to use the site. Are these walls a legal solution for these sites? Here is an example from the Washington Post. You need to agree to tracking to continue to the site or you need to pay to avoid tracking. Slate's implementation only offers an "agree" button, which leads you to their site, which probably uses tracking. If the website containing the GDPR-wall processes any personal data of users who hit the GDPR-wall, the GDPR applies to that website. This can be as simple as writing a logfile of all visits to the website. In this case it will be illegal if the website owner does not comply with the GDPR. However a supervisory authority would probably not spent any time on such a minor violation. As long as the the website with the GDPR-wall does not process any personal data, the GDPR does not apply, so nothing in the GDPR can forbid the GDPR-wall. If personal data is processed based on consent, that consent must be freely given. Also it may not be disruptive. So a cookie wall asking for consent would be illegal. 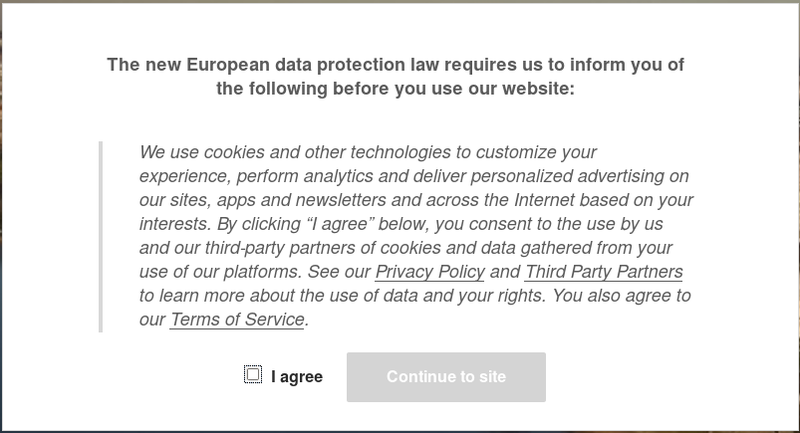 But the GDPR does not care about any other disruptive popups, as long as they are not related to asking for consent. Using GeoIP is a perfect way to implement such a GDPR-Wall, because it would block everyone from within the EU, but nobody else. So it blocks exactly those for who the GDPR would apply. In such a case it would not be reasonable to expect anything more from a website owner. A user which uses a proxy, can not expect to be protected by the GDPR, because it bypasses a restriction set by the owner of the website. A webserver does use the IP-address of all incoming requests, to send the reply back. That could be considered a processing of personal data, but everybody seems to agree it is not. I am not sure why. But I do agree that it would be very impractical if that is considered processing of personal data. So you have to pay $9/month for a GDPR compliant subscription. Because the price you have to pay is not unacceptable high, I think it would be valid to offer the premium version this way. This does not force you to choose one of the other subscriptions. However, the free and basic version are clearly not GDPR compliant. I am not sure it is valid to offer those to people in the EU. 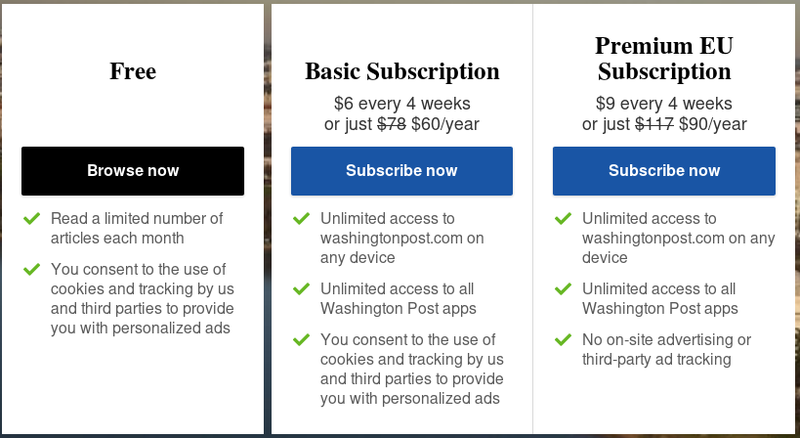 If getting through the wall requires the user to agree to the use of their data for advertising purposes, like the WaPo one in your example, then it is probably illegal. The GDPR does not allow use to be coupled with agreement to use personal data. Not the answer you're looking for? Browse other questions tagged privacy terms-of-service gdpr or ask your own question. Excluding all people from the EU from my blog - is this allowed? GDPR - What's classed as an opt in for Google Analytics cookie and do I need to do it? GDPR: are faces always considered identifiable information? GDPR and hotlinked images: are they allowed?